CEBU, Philippines - The Maximo siblings Luis Miguel and Ana Patricia both won in their respective categories during the Pink October Run, a charity event organized for cancer awareness yesterday at the Cebu Business Park. 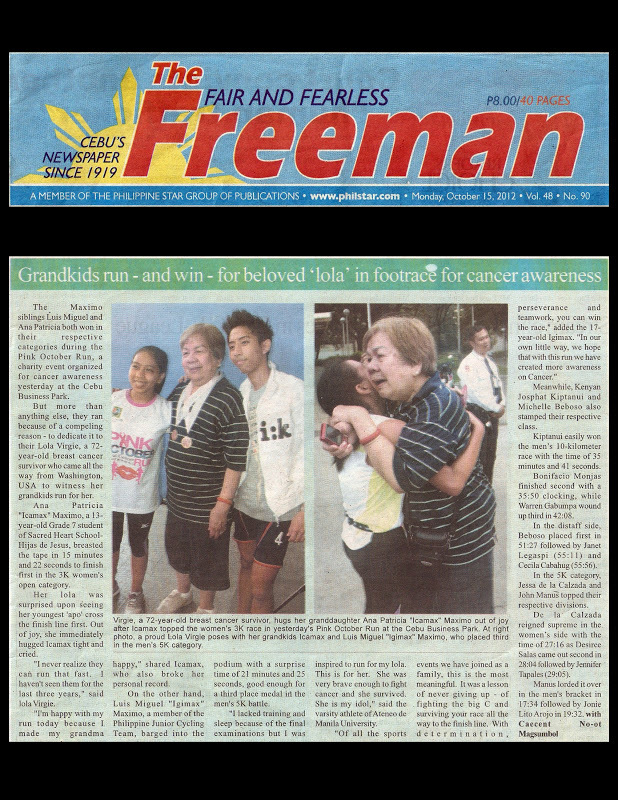 But more than anything else, they ran because of a compeling reason - to dedicate it to their Lola Virgie, a 72-year-old breast cancer survivor who came all the way from Washington, USA to witness her grandkids run for her. Ana Patricia "Icamax" Maximo, a 13-year-old Grade 7 student of Sacred Heart School-Hijas de Jesus, breasted the tape in 15 minutes and 22 seconds to finish first in the 3K women's open category. Her lola was surprised upon seeing her youngest 'apo' cross the finish line first. Out of joy, she immediately hugged Icamax tight and cried. "I never realize they can run that fast. I haven't seen them for the last three years," said lola Virgie. "I'm happy with my run today because I made my grandma happy," shared Icamax, who also broke her personal record. On the other hand, Luis Miguel "Igimax" Maximo, a member of the Philippine Junior Cycling Team, barged into the podium with a surprise time of 21 minutes and 25 seconds, good enough for a third place medal in the men's 5K battle. "I lacked training and sleep because of the final examinations but I was inspired to run for my lola. This is for her. She was very brave enough to fight cancer and she survived. She is my idol," said the varsity athlete of Ateneo de Manila University. "Of all the sports events we have joined as a family, this is the most meaningful. It was a lesson of never giving up - of fighting the big C and surviving your race all the way to the finish line. With determination, perseverance and teamwork, you can win the race," added the 17-year-old Igimax. "In our own little way, we hope that with this run we have created more awareness on Cancer." Meanwhile, Kenyan Josphat Kiptanui and Michelle Beboso also stamped their respective class. Kiptanui easily won the men’s 10-kilometer race with the time of 35 minutes and 41 seconds. Bonifacio Monjas finished second with a 35:50 clocking, while Warren Gabumpa wound up third in 42:08. In the distaff side, Beboso placed first in 51:27 followed by Janet Legaspi (55:11) and Cecila Cabahug (55:56). In the 5K category, Jessa de la Calzada and John Manus topped their respective divisions. De la Calzada reigned supreme in the women’s side with the time of 27:16 as Desiree Salas came out second in 28:04 followed by Jennifer Tapales (29:05).